IN A RECENT ARTICLE on this blog I explored the Métro station Jaurès in the 19th arrondissement. This Métro station fascinates me partly because it is one of Fulgence Bienvenüe’s Métro stations aériennes, (all his stations aériennes fascinate me), and partly because it is named after a man who particularly interests me, Jean Jaurès. 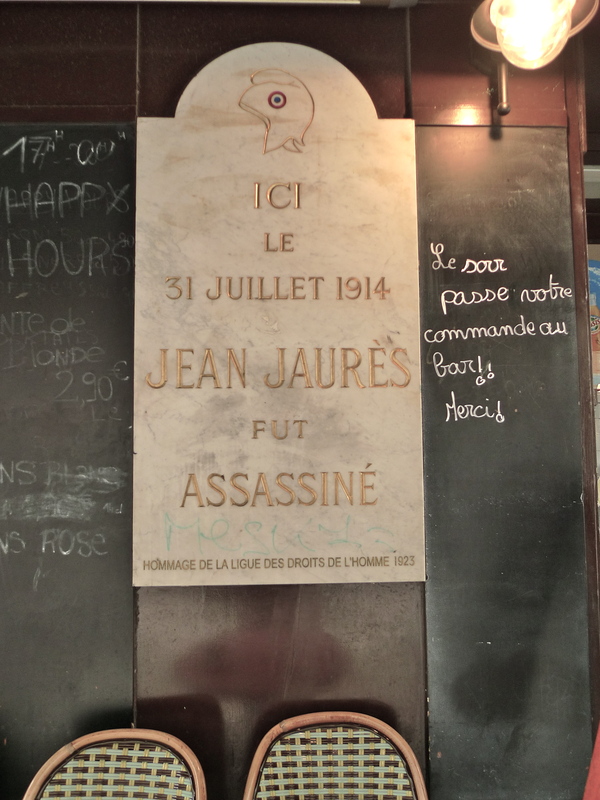 In the blog piece, I refer to the fact that Jean Jaurès was assassinated in the Café du Croissant in rue Montmartre just days before the outbreak of the First World War. 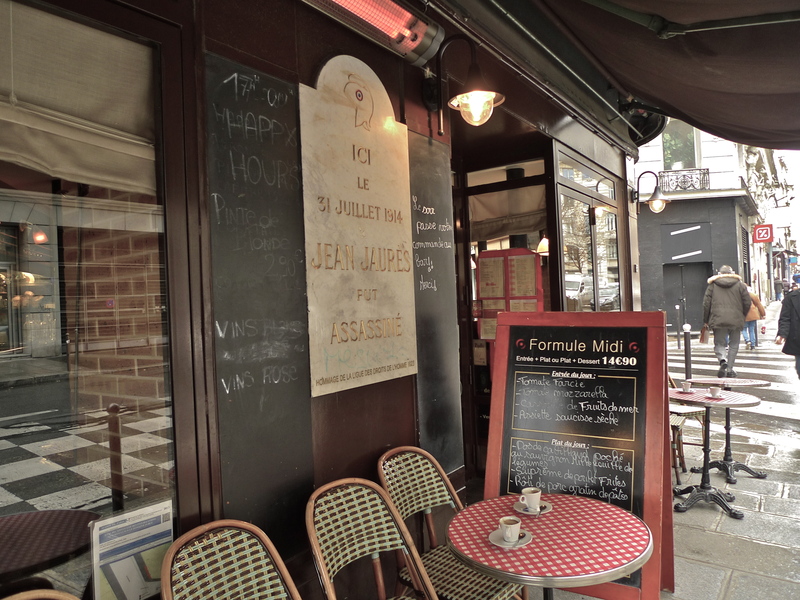 The other day I found myself in rue Montmartre and, in need of shelter from the rain, I ducked into the nearest café which just happened to be the very same Café du Croissant, or La Taverne du Croissant as it’s now called, in which Jaurès died. Since I had recently published my blog piece about the Métro station Jaurès, and since this year is the centenary of the outbreak of the Great War, Jaurès has been much on my mind so coming upon the Café du Croissant like this seemed a curious coincidence. 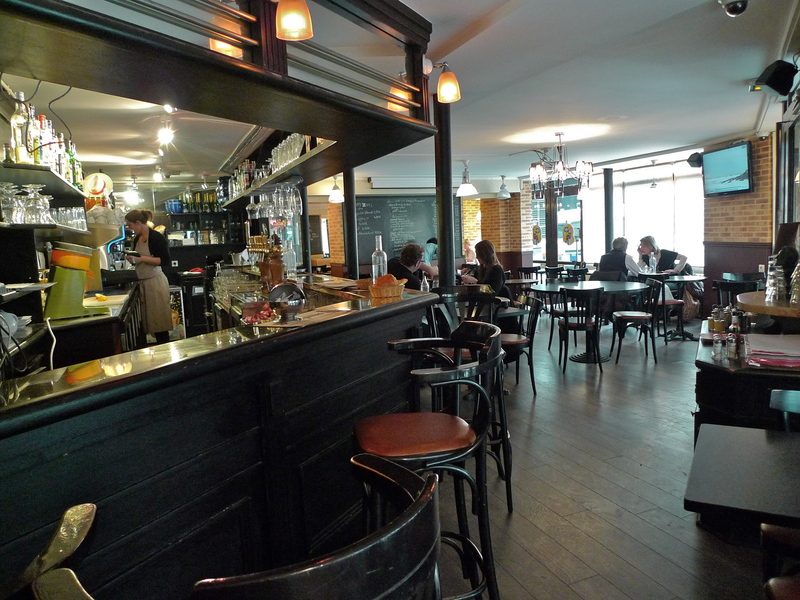 La Taverne du Croissant with its dark wooden furniture and its wooden floors has a comfortable feel to it but, save for the plaque on the wall outside, there is little to remind one of the event that took place here a hundred years ago. Auguste Marie Joseph Jean Léon Jaurès was born on 3rd September 1859 in Castres in the south west of France. He was educated in Paris and admitted to the prestigious École normale supérieure in 1878 to study philosophy. He graduated in 1881 and then spent two years teaching philosophy in southern France before taking up a lecturing post at the University of Toulouse. 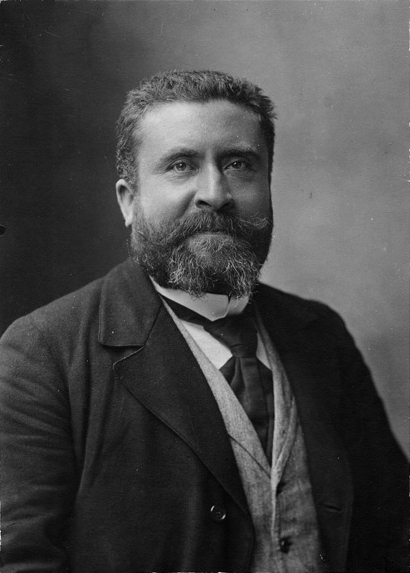 Jean Jaurès’ political career began in 1885 when he was elected deputy (member of the legislative assembly of the French Parliament) for the Tarn département. He was initially a moderate republican but by the late 1880’s he had fully embraced socialism. Over the next few years, Jaurès won and lost seats to the National Assembly several times but in 1902 he was returned as the deputy for Albi, a seat he retained until his death. As well a being a politician, Jaurès was also a journalist. He edited La Petite République, and was, along with Émile Zola, one of the most energetic defenders of Alfred Dreyfus during the notorious Dreyfus Affair. In 1904, he founded the socialist paper L’Humanité, a newspaper that still exists. At the end of the 19th century, with its leaders either dead or exiled after the failure of the Paris commune in 1871, French socialism was in disarray. It wasn’t until 1905, with the establishment of SFIO, the Section Française de l’Internationale Ouvrière (French Section of the Workers’ International) that the Left gained some coherence. SFIO was led by Jules Guesde and Jean Jaurès, but it was Jaurès who quickly became its most influential figure. Jean Jaurès was also a pacifist, something that was to cost him his life. As the dark clouds descended over Europe in 1914, Jean Jaurès passionately believed that it was worth trying to use diplomatic means to prevent war. He tried to promote understanding between France and Germany and then, as conflict became imminent, he tried to organise general strikes in France and in Germany in order to force the governments to back down and negotiate. Jaurès though was swimming against the tide. Defeat in the Franco-Prussian war of 1870-71 and the loss of Alsace-Lorraine still loomed large in the minds of the French establishment; revenge for the former and the return of the latter seemed to overshadow Jaurès’ efforts. On the afternoon of 30th July 1914, Jean Jaurès returned to Paris from an emergency meeting of the International Socialist Bureau of the Second International in Brussels. Austria had already mobilised and upon his arrival in Paris Jaurès learned that Russia had now mobilised as well. 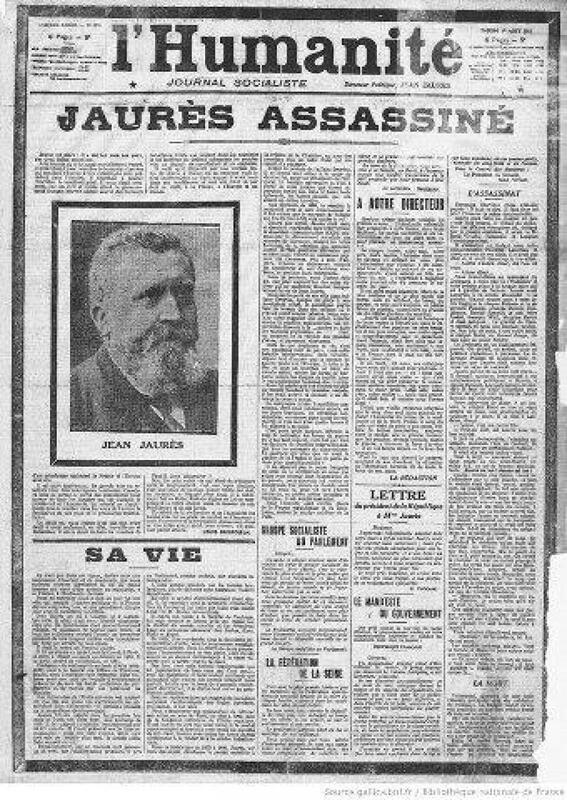 The following morning, the 31st July, Jaurès had a succession of meetings and then, during the afternoon, he went to his newspaper, L’Humanité, to write a piece about ‘antiwar mobilisation’ for publication the following day. 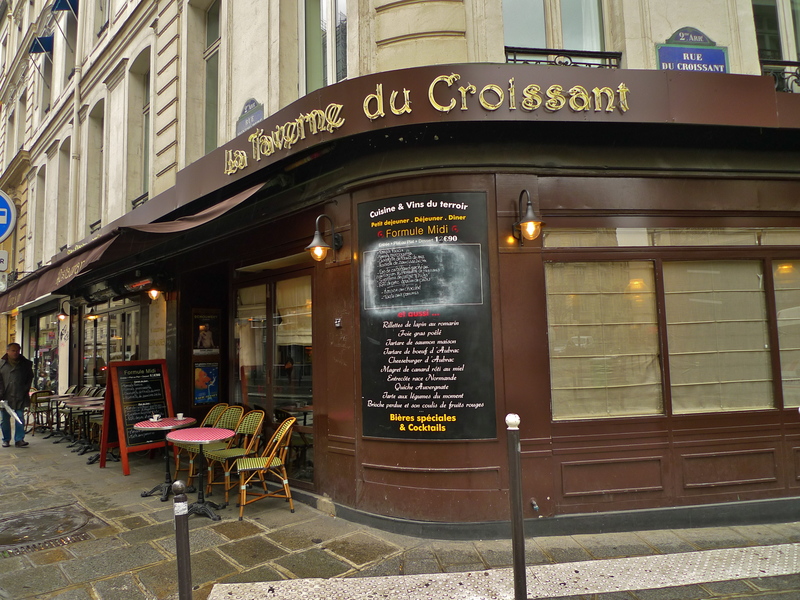 In the evening he went to the Café du Croissant for dinner with four colleagues. Jaurès sat at a table with his back to an open window shielded from the street by a drawn curtain. In the street outside, a 29 year old archaeology student, a member the League of Young Friends of Alsace-Lorraine and a French nationalist, Raoul Villain, stood poised ready to assassinate a man he had never met. He fired two shots from a Smith & Wesson revolver. One shot missed and lodged into some woodwork, the other pierced Jaurès’ skull and he fell dead. Reaction to Jaurès’ death was mixed, the Left were understandably angry while some on the Right rejoiced but across Europe the reaction was a wave of shock. This seemed to be yet another link in the chain of uncertainty that was engulfing Europe. Sitting in the Café du Croissant in 2014 over a cup of coffee with the rain pattering on the windows close to the spot where Jaurès was shot, I couldn’t help thinking about how normal everything seemed, people engaged in conversation, the sound of crockery clinking, the lady behind the bar going about her work. I also couldn’t help thinking about Jean Jaurès and his ideals and wondering what might have been if his vision that ordinary people acting in sufficient numbers and with sufficient strength could have prevented the terrible slaughter that subsequently unfolded. In death, Jean Jaurès received the ultimate accolade the French can bestow. Ten years after his death, his remains were transferred to the Panthéon. Astonishingly, in 1919, Raoul Villain was acquitted of the murder of Jean Jaurès. On the 17th September 1936 he was shot and killed during the Spanish Civil War. He is buried in the cemetery of Sant Vicent de sa Cala on the island of Ibiza.